PRIMARY OPERATOR - Please note that in order to protect the integrity and stability of the system, the capabilities mentioned below apply to the Administrator role (primary operator); if you are not the primary operator and you need any changes made to the system that require the use of the following instructions, please contact your primary operator with your request(s). This is where you configure the people who have access to the system. It can be launched directly from Settings. New: Creates a new item. Open: Opens the highlighted item. Print: Prints the existing visible list. Print Preview: Print previews the existing visible list. Export: Exports the existing visible list. First Name: The user's first name. Roles: The role the person was given. Commission: If this person has a commission it will show. Start Time - Start time of Copy/Oar. User Name: The name the user uses in RadioTraffic. Last On: Date of the that usage of this user. Comm%: The Commission percentage if they have a commission. Open - Opens the highlighted item. New - Creates a new item. Merge - Provides the ability to merge the selected item with another. Trash - Flags the highlighted item as "inactive". UnTrash - Flags the highlighted item as "active". Only see on a trashed user. F1 - Launches the help system (requires correctly configured default web browser). F4 or Ins - Creates a new item. F5 - Refreshes the view from the server. F6 or Esc - Closes the window. Enter - Opens the highlighted item. Home - Moves the highlight line to the top of the list. End - Moves the highlight line to the bottom of the list. Clicking on the New button a creates an item. To allow access to the system, each person has their own account. 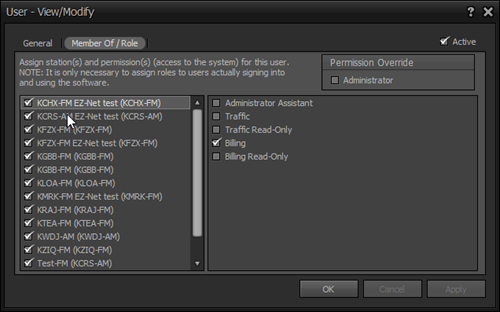 This is where you can add, remove, apply permission settings (access) on a Station-by-Station basis. To add new users into the system, see above (Users). The settings related to each user is divided into multiple tabs. See Common UI Behaviors. There is an Active check box located in the upper right hand corner. When checked, the account is enabled. When not checked, the account is disabled; meaning the account can not be used to sign into the system. First Name - The first name of this person. This field is required. Last Name - The last name of this person. This field is required. Email - The person's email address. Default Commission Type - If this user receives commission, designate the commission type that they typically receive. If they do not receive commission, select "None." This field is the ultimate key to whether or not a person is visible as a SalesPerson in Contracts and Reports. Selecting None effectively removes the person from the list when creating a new Contract. The available entries in this field are determined by Commissions. Note: If the person is a SalesPerson on any Contract, they will remain so regardless of changing the default commission type to None after it has been set to other than None. However, future Contracts will not provide this account as a selection. 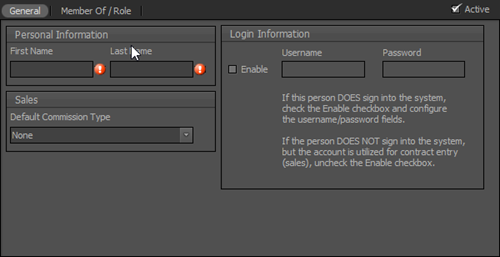 Enable - If this user signs into RadioTraffic, check this box and configure the username and password fields. If this user does not sign into the system, such as a sales person who does not enter contracts, but is assigned customer ownership for reporting purposes, leave this box unchecked. Username - The username that will be used to enter the system. Password - The password that will be used to enter the system. This tab provides you the ability to assign the type of permissions this user will have in RT on a station-by-station basis. The Administrator role is the person within your organization that is ultimately responsible for the integrity, stability and overall operation of the system. Only one person can be assigned to this role. This role is also referred to as the primary operator. To configure this role for the person associated within this window, enable the Administrator check box in the Permission Override box. The current Administrator (you) will automatically be reassigned the role of Administrator Assistant for all active stations. The tab is separated into two sides. The left side contains the list of Stations. When you highlight a station on the left hand side, the right hand side shows the role(s) that are currently enabled for this person for this Station. Provides access to all things related to "Traffic" and "Billing" and the necessary permissions to perform all related normal day-to-day tasks, as well as a few "safe" administration capabilities above and beyond those afforded to the Traffic and Billing roles. Admin Asst does not have access to Groups, Users and Stations in Settings, They have limited ability to manipulate history and cannot delete. Provides access to all things related to "Traffic" and the necessary permissions to perform all related normal day-to-day tasks. This is a "read-only" role that has access to all things related to "Traffic". These permissions provide the ability to fully use all the features available in the software except deleting data. Provides access to all things related to "Billing" and the necessary permissions to perform all related normal day-to-day tasks. This is a "read-only" role that has access to all things related to "Billing". The account provides the ability to fully use all the features available in the software except deleting data. ★ Not available in Essentials. Note: More than one role can be active at any given time for each Station. Users can have a different set of roles on a per-Station basis. TODO Add any questions as they come up to this section.